These take a long time to make, but are so fun! 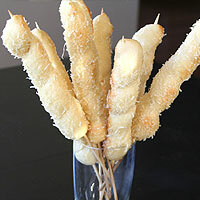 You can bake them the same day you make them, or refrigerate the shaped breadsticks overnight. 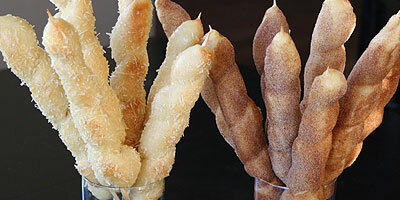 You can of course make normal breadsticks out of them and they are delicious. 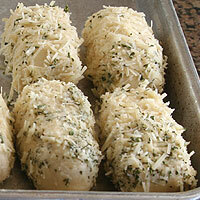 See instructions for pictures and details on the Parmesan and Stone Baked variations. Add all ingredients and knead on low 10-12 minutes. The dough should be tacky and very pliable. If it is dry add water 1-2 T at a time. If it is too sticky add flour 1-2 T at a time. Form into a ball and cover with plastic wrap. Let rise 1 1/2 hours at room temperature. Buttermilk powder is great because you can keep it on hand without it spoiling like fresh buttermilk. 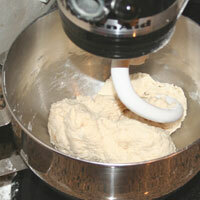 I wouldn't use it as a substitute in most recipes, but for bread doughs, it works great. 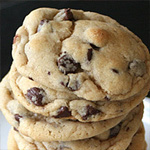 To use in this recipe: 3 T (1 oz) buttermilk powder and 1 c minus 2 T (7 oz) water. Spray two jellyroll pans with cooking spray and set aside. 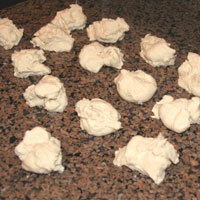 Break dough into 16 equal pieces (2 oz each). You will have about 1 oz extra. Just discard this. 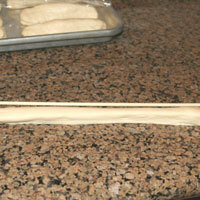 Form into a long roll shape by pushing dough into the bottom with your thumbs and pinching the bottom. This forms a tight skin on top. Place on one prepared sheet. Cover with plastic wrap and let rest 20 minutes. Pick up each piece and gently stretch. Don't stretch it farther than it's ready or it will be uneven or tear. Let it rest longer if it resists stretching. 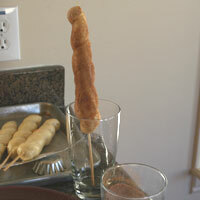 Place formed dough next to a skewer. It should be the length of the skewer. An autolyse is when the dough rests which relaxes the gluten. This allows it to stretch easily and evenly. Take the dough and wrap the top 1/8" from the tip. Pinch the dough to seal. 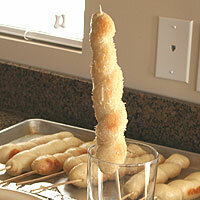 Turn the skewer while wrapping the dough around it. 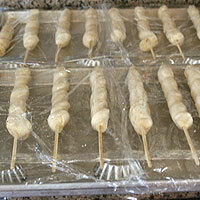 The dough should extend about 2/3 the length of the skewer. Pinch at the end to seal. Lay flat on prepared pan. Place 8 pieces per sheet. You don't want to overcrowd them, they will stick together. Cover with plastic wrap and refrigerate a few hours or overnight. If you would like to bake them sooner, continue to the next step and let them rise on the supports. Set two jellyroll pans on the work surface. 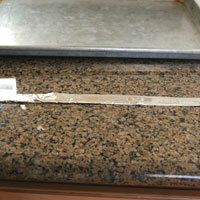 Measure a piece of aluminum foil about 6 inches longer than the length of the pan. Fold in half lengthwise and keep folding in half until about 1/2 inch wide. Wrap lengthwise around pan about 1 inch from the side. Place a few supports under the foil. I used mini tart tins. Canning jar lid rims work well also. Repeat the foil process for the second pan. I have made these suspended in a 9x13 pan and they didn't work very well. Much of the dough drooped to the bottom of the pan. Remove the dough from the refrigerator 45-60 minutes prior to baking. 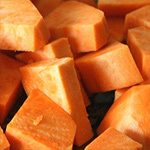 Immediately remove each piece from the refrigerated sheet onto the prepared sheet. Place the tip of the skewer on the rim of the pan and the end on the foil. Cover with plastic wrap and proof 45-60 minutes. Position the top rack of the oven on the second highest setting. Preheat the oven to 450 at least 30 minutes before baking. The amount of time to proof the dough will vary greatly depending on the temperature. In the winter, it takes a lot longer than in the hot kitchen in the summer. To speed rising in a cold house, place a hot pad under it. Bake at 450 8-10 minutes until tops are starting to brown. 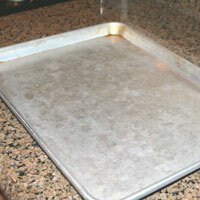 Most ovens will only fit one jellyroll pan per rack, so bake one sheet at a time. While they are baking melt butter and set aside. Measure parmesan and set aside. Measure cinnamon and sugar and set aside. When the breadsticks are done brush, generously butter them using a pastry brush and set on the hot pan. Put the second batch in the oven to bake then proceed to top the hot buttered breadsticks. On a seperate plate generously coat with parmesan. 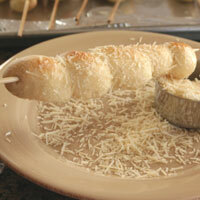 It is best to use a seperate plate so you can collect the parmesan that has fallen off the breadstick and re-use it. If it falls onto the hot buttery pan it will be difficult to re-use and not look as good. Place upright in glass and repeat with the remaining breadsticks. On a seperate plate generoulsy coat with cinnamon and sugar. It is best to use a seperate plate so you can collect the cinnamon and sugar that has fallen off the breadstick and re-use it. If it falls onto the hot buttery pan it will be difficult to re-use and not look as good. 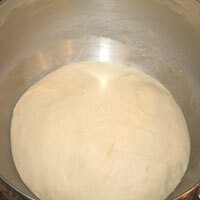 Follow the instructions for dough and shaping excluding the final stretch. They should be about 6 inches long. Place them loosely side by side. Cover with plastic wrap and refrigerate overnight. An hour before baking, remove from the refrigerator. Immediately sprinkle a peel or inverted cookie sheet with cornmeal, semolina, or flour. Transfer the breadsticks to this and gently shake to make sure they aren't sticking. Cover loosely with plastic wrap and proof 60 minutes. Prepare the oven by placing the top rack on the second to highest setting. Preheat the oven to 450 at least 30 minutes before baking. Gently shake again to make sure the breadsticks aren't sticking. 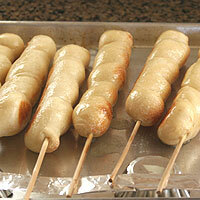 If they are, slide a little more cornmeal, semolina, or flour under the sticky part. Slide onto the hot stone and bake 6-8 minutes until golden brown. While they are baking, melt butter and add garlic powder. Immediately after breadsticks come out, brush them generously with butter/garlic mixture. Sprinkle desired amount of parmesan on top. Transfer to a cloth-lined basket or serving tray so the bottoms stay crisp. Serve hot. 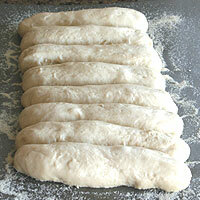 Follow the instructions for dough and the first step of shaping. They should be about 3 inches long, 1 inch tall, and 1 inch thick. In one bowl soften butter and stir until smooth. Don't melt completely, it won't stick to the dough as well. 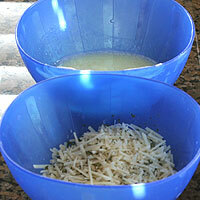 In a second bowl mix parmesan and parsley. Roll each shaped in the butter and coat completely. Roll in parmesan/parsley and coat completely. Place on jellyroll pan 6 across. They will be almost touching. Cover with plastic wrap and refrigerate overnight. Remove 1 hour prior to baking. 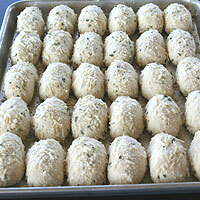 To bake sooner, cover and let rise 45-60 minutes until doubled in size. Preheat oven to 350 15-30 minutes before baking. Bake 15 minutes until lighlty browned on top. Brush with melted butter if desired. 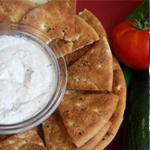 Transfer to a cloth-lined basket or serving tray so the bottoms stay crisp. Serve hot. For a full jellyroll pan, double the recipe. 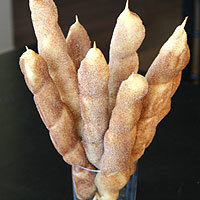 Droopy breadsticks - The first time I made these I used a 9x13 pan because the skewer fit nicely suspended on the top. The bread drooped off the skewers and I ended up with a mess. 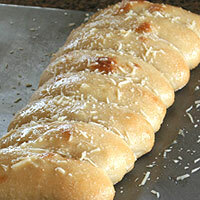 A jellyroll pan is a good fit, the bread can rise on the top and the bottom and it still supports the dough. 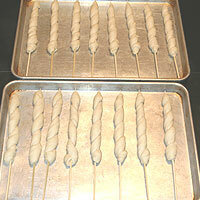 Flat breadsticks - Baking them flat on the sheet is not worth the work it takes to shape them around the skewer. The bottom bakes flat and they don't look very good served as shown in the glass. 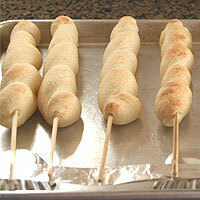 If you don't plan on suspending them, follow the instructions for stone baked or flavored breadsticks. 1. Add all ingredients and knead on low 10-12 minutes. The dough should be tacky and very pliable. If it is dry add water 1-2 T at a time. 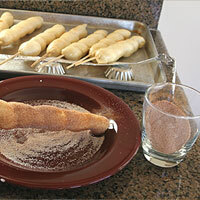 If it is too sticky add flour 1-2 T at a time. Form into a ball and cover with plastic wrap. Let rise 1 1/2 hours at room temperature. It should double in size. 1. Spray two jellyroll pans with cooking spray and set aside. 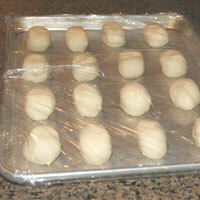 Break dough into 16 equal pieces (2 oz each). You will have about 1 oz extra. Just discard this. 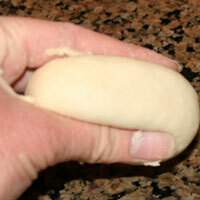 Form into a long roll shape by pushing dough into the bottom with your thumbs and pinching the bottom. This forms a tight skin on top. Place on one prepared sheet. Cover with plastic wrap and let rest (1)20 minutes. 2. Pick up each piece and gently stretch. Don't stretch it farther than it's ready or it will be uneven or tear. Let it rest longer if it resists stretching. 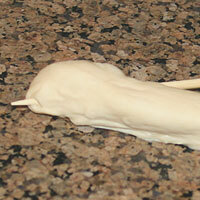 Place formed dough next to a skewer. It should be the length of the skewer. Take the dough and wrap the top 1/8" from the (2)tip. Pinch the dough to seal. 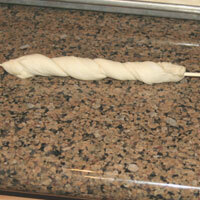 Turn the skewer while wrapping the dough around it. 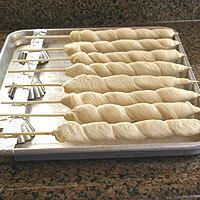 The dough should extend about 2/3 the length of the skewer. Pinch at the end to seal. Lay (3)flat on prepared pan. Place 8 pieces per sheet. You don't want to overcrowd them, they will stick together. 3. 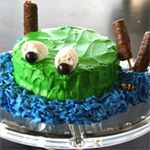 Cover with plastic wrap and refrigerate a few hours or overnight. If you would like to bake them sooner, continue to the next step and let them rise on the supports. 1. Set two (4)jellyroll pans on the work surface. 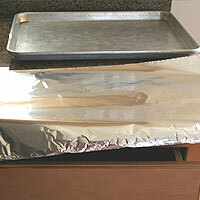 Measure a piece of aluminum foil about 6 inches longer than the length of the pan. Fold in half lengthwise and keep folding in half until about 1/2 inch wide. Wrap lengthwise around pan about 1 inch from the side. Place a few supports under the foil. I used mini tart tins. Canning jar lid rims work well also. Repeat the foil process for the second pan. 2. Remove the dough from the refrigerator 45-60 minutes prior to baking. Immediately remove each piece from the refrigerated sheet onto the prepared sheet. Place the tip of the skewer on the rim of the pan and the end on the foil. Cover with plastic wrap and proof 45-60 (5)minutes. Position the top rack of the oven on the second highest setting. Preheat the oven to 450 at least 30 minutes before baking. 3. Bake at 450 8-10 minutes until tops are starting to brown. 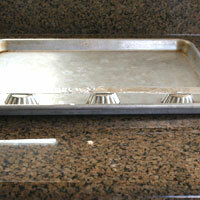 Most ovens will only fit one jellyroll pan per rack, so bake one sheet at a time. While they are baking, melt butter and set aside. Measure parmesan and set aside. Measure cinnamon and sugar and set aside. 4. When the breadsticks are done, generously butter them using a pastry brush and set on the hot pan. On a seperate plate generously coat with parmesan. Place upright in glass and repeat with the remaining breadsticks. It is best to use a seperate plate so you can collect the parmesan that has fallen off the breadstick and re-use it. If it falls onto the hot buttery pan it will be difficult to re-use and not look as good. Bake the second pan and repeat process with butter, then the cinnamon and sugar mixture. 1. Follow the instructions for dough and shaping excluding the final stretch. They should be about 6 inches long. Place them loosely side by side. Cover with plastic wrap and refrigerate overnight. An hour before baking, remove from the refrigerator. To bake them sooner let rise at room temperature. 2. Immediately sprinkle a peel or inverted cookie sheet with cornmeal, semolina, or flour. Transfer the breadsticks to this and gently shake to make sure they aren't sticking. Cover loosely with plastic wrap and proof 60 minutes. Prepare the oven by placing the top rack on the second to highest setting. Preheat the oven to 450 at least 30 minutes before baking. 3. Gently shake again to make sure the breadsticks aren't sticking. If they are, slide a little more cornmeal, semolina, or flour under the sticky part. Slide onto the hot stone and bake 6-8 minutes until golden brown. While they are baking, melt butter and add garlic powder. Immediately after breadsticks come out, brush them generously with butter/garlic mixture. Sprinkle parmesan on top. Transfer to a cloth-lined basket or serving tray so the bottoms stay crisp. Serve hot. 1. 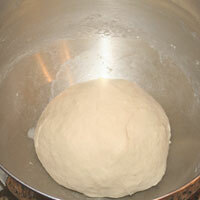 Follow the instructions for dough and the first step of shaping. They should be about 3 inches long, 1 inch tall, and 1 inch thick. 2. 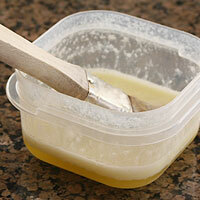 In one bowl soften butter and stir until smooth. Don't melt completely, it won't stick to the dough as well. In a second bowl mix parmesan and parsley. Roll each shaped in the butter and coat completely. Roll in parmesan/parsley and coat completely. Place on half jellyroll pan 6 across. They will be almost touching. Cover with plastic wrap and refrigerate overnight. Remove 1-2 (5)hours prior to baking. 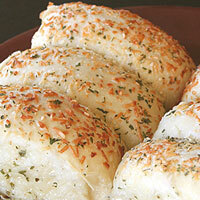 To bake sooner, cover and rise at room temperature 45-60 minutes. Preheat oven to 350 15-30 minutes before baking. 3. Bake 15 minutes until lighlty browned on top. Brush with melted butter if desired. Transfer to a cloth-lined basket or serving tray so the bottoms stay crisp. Serve hot. 1. An autolyse is when the dough rests which relaxes the gluten. This allows it to stretch easily and evenly. 2. Lay the breadsticks flat on the cookie sheet. They will be suspended during the proof and while baking. If you bake them sooner, let them proof on the supports. 3. The tip of the skewer needs to be exposed to it can be suspended on the baking sheet later on without the dough sticking to it. 4. I have made these suspended in a 9x13 pan and they didn't work very well. Much of the dough drooped to the bottom of the pan. 5. The amount of time to proof the dough will vary greatly depending on the temperature. In the winter, it takes a lot longer than in the hot kitchen in the summer. To speed rising in a cold house, place a hot pad under it.